I have recently cut way back on grains and really focused on eating highly nutritious food. I feel so much better for it – much less sluggish and bloated. I have been eating much more protein and really trying to find ways to incorporate more fresh vegetables into my diet. It’s easier to find satisfying food that is gluten/grain free for lunch and dinner but I have really been missing a slice of toast or a big bowl of crunchy granola for breakfast. 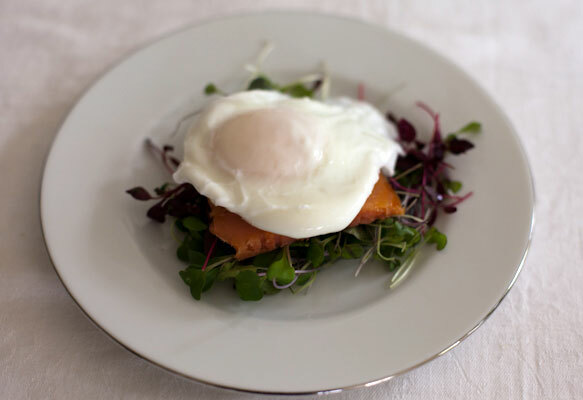 That’s when I came up with this high protein meal of smoked salmon and poached eggs on top of micro greens. I usually think of making scrambled eggs with smoked salmon but I like the way the yolk of the egg acts almost like a dressing on the micro greens as you break into it. My father-in-law, chef Jean Jacques Rachou, showed me how to poach eggs this way when we were making eggs Benedict for MADE IN AMERICA. He doesn’t use vinegar in the water or a whirlpool swirl – rather he just gently slides the egg into soft boiling water in a shallow pan from a tea cup. The egg takes about 3 minutes to cook so that the yolk is soft but the white is set. After lifting the egg out of the water and blotting it on the paper you can trim any excess white for the perfect round egg – no special equipment needed. This past weekend for a girl’s brunch get together hosted by Gaby Dalkin of WhatsGabyCooking I decided to make this, not daunted by having to make poached eggs for one and all – it really is super easy and such a satisfying addition to any brunch – you really won’t be missing the hot buttered toast or sugary muffins. Carrie Vitt of Deliciously Organic called me on her drive back home in the evening to ask if I’d used olive oil on the greens – she then posted this instagram of her lunch today. @JenJerk (Jenny Kayano, who was also at our brunch) then replied on Twitter: Darn it, i was *totally* craving that this morning! i just couldn’t get my act together to make it for brekkie! To quote Oscar Wilde – the only way to get rid of temptation is to yield to it – I say forget brekkie have this for supper. 1. Make a little mound of micro greens in the center of the plate and give this squirt of lemon juice. Place small pieces of the smoked salmon on top and give these a squirt of lemon juice and a little black pepper. 2. In a pan bring about 2 – 3 inches of water to a soft boil. Crack the egg in to a tea cup and then gently slide this into the water. Poach for about 3 minutes, until the top of the yolk is turning white. Remove with a slated spoon and blot very gently on kitchen towel to remove any excess water. Trim off any loose pieces of egg white. 3. Place the egg on top of the salmon and micro greens. Grind a little extra black pepper and serve immediately. I was going to call this new series ‘Quick Fixes’ – being simple, quick and easy to do, but ‘quick’ sounds so short term and not really part of the long term changes I hope these posts will inspire to help make you feel great. How about Lean Fixes? I don’t want to get bogged down with the whys and wherefores of these recipes and meal plans – but rather jump right in and share the little things I now do to help maintain a healthy body and to Get Lean! I love how easy this dish is and it contains all ingredients I enjoy. who knew the most delicious food was so easy to prepare?! I bought the ingredients after we talked on the phone and have eaten it for lunch each day this week. Thank you! one more reason i need to pick up some smoked salmon soon. i love poached eggs! This is my kind of meal and definitely perfect for a girl’s brunch. Thanks for sharing the recipe, Lucy! It’s amazing what Microgreens to do to a dish. I absolutely love having Microgreens in all my home made meals. I can’t get enough of them..